. : Back to Brewer for another taste of Zamboni snow! :: Ski XCOttawa.ca :: Skiing in Ottawa and Gatineau Park :. Back to Brewer for another taste of Zamboni snow! It was about that time of year where rollerskiing is becoming a bit of drag and the feeling of gliding over snow seems close but yet so far away in the mind of a skier. After a successful event of skiing at Brewer Park around this time last year using the the zamboni snow from the nearby arena, we found ourselves with more than enough motivation to pull off the event once again. Making it the "2nd Annual Brewer Park Ultra Sprint Race." Here is a collection of photos from an awesome night of skiing in the city! The snow pile. This is were the hard work and dedication comes in. Thankfully, we brought even more of our crazy ski buddies this time and within an hour of shoveling and serious course design we were flying around the track. Logan getting right to it with the snow scoop. Lot's of those were one of this year's improvements. Here's the gang all ready to go for the sprint heats. First, Colin has to put the finishing touches on the track. This year we widened the course quite a bit, even enough to actually skate ski in some sections. And now were ready to ski! Let the intense racing action begin! Lee Hawkings on your right, challenging Logan Potter on the left. Sheila and her son Evan Kealey even made it out this year. Evan gets the victory in this race! Freya definitely enjoyed the snow. I don't think she stopped skiing for the entire time she was there....and even gave last year's champ a run for his money! Colin and Lee ready to go. Lee has been pretty hungry for snow lately, maybe a little too hungry that night, hey Lee! He was killing it in the sprints though. But this year he was edged out in a close final race, crowning Lee Hawkings the 2010 Brewer Park Ultra Sprint Champion. Big shout out to all the people who came out to help shovel and race, especially the solid crew from the Carleton Ski Team. It's good to know were not the only crazy fools who can't wait for the ski season to be here. Luckily, last night the real snow started falling from the sky, and we did our first real ski of the year in the Park this morning. Stay tuned for another article posting with some pictures and videos from today's workout! 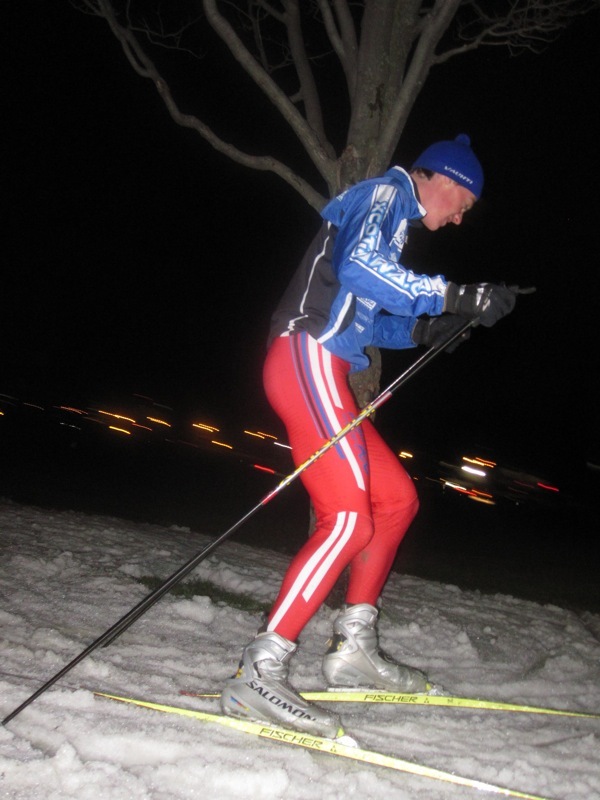 XC News: The Polar Ski-Off 2017! Join my team!! Team Mark Rajack !! Athlete Diary: Athlete Diary: Racing is Starting.